I attended Demo Day and the Un-Conference (and, organized a panel discussion at the latter), and also, had dinners with the MassChallenge founders and Backupify’s Rob May, as well as a lunch with TechStars alumnus Winston Mok. There was also an impromptu joke-fest with Nate Drouin and Kerryn Gerety. So, it was a lot of community buildin’ stuff. It was fun. In particular, Demo Day had a special place in my heart. 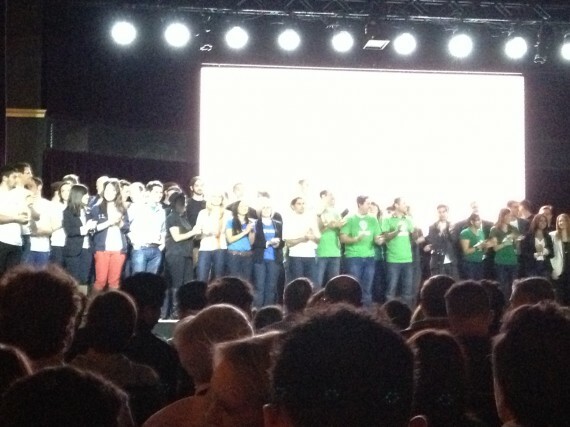 Here’s a photo of all of the entrepreneurs on stage. I mentored two TechStars team this class (BetterFit and Fetchnotes) and was feeling very sentimental as they presented their pitches to the huge crowd. I will miss working with them, but hope both will continue to reach out for help and unbiased advice. I think in the end, it’s all about community. Each of us has tremendous challenges and obligations. But, there’s something great that happens when a start-up community gathers to cheer on entrepreneurs and to help out each other. It’s cool when 1+1=3 when we rally….